SolarEdge inverters are fixed-voltage inverters designed specifically for use with SolarEdge power optimizers. They include integrated arc fault protection (Type 1) for NEC 2011 690.11 compliance. These single-phase SolarEdge inverters feature superior efficiency, smaller size, lighter weight and are easy to install, with built-in module-level monitoring. MPPT tracking and voltage management are handled by the power optimizers providing an efficient, low cost inverter. 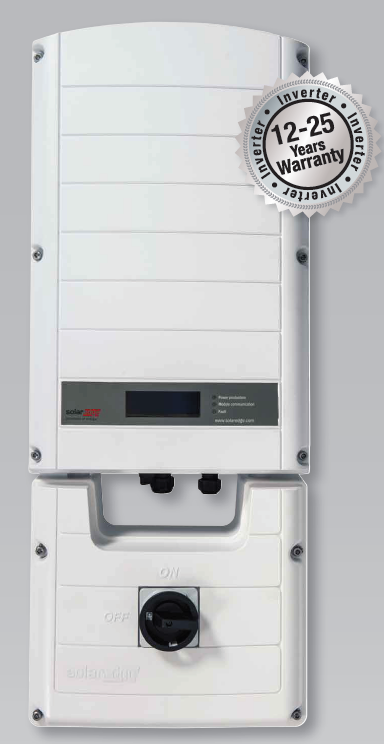 The SolarEdge inverters operate at a fixed voltage which is supplied by the SolarEdge Power Optimizers and are lightweight and also include built-in Module Level Monitoring, and a DC disconnect, Ethernet interface as well as an RS-485 serial port. The built-in SafeDC feature automatically limits the DC voltage from the power optimizers to 1 VDC per module when it detects excessive heat or when the inverter is not connected to the grid — an important safety feature for installers.